In the fifth year of our persecution, say the acts, Sapor being at Seleucia, caused to be apprehended in the neighboring places one hundred and twenty Christians, of which nine were virgins, consecrated to God; the others were priests, deacons, or of the inferior clergy. They lay six months in filthy stinking dungeons, till the end of winter: during all which space Jazdundocta, a very rich virtuous lady of Arbela, the capital city of Hadiabena supported them by her charities, not admitting of a partner in that good work. During this interval they were often tortured, but always courageously answered the president that they would never adore the sun, a mere creature for God; and begged he would finish speedily their triumph by death, which would free them from dangers and insults. Jazdundocta, hearing from the court one day that they were to suffer the next morning, flew to the prison, gave to every one of them a fine white long robe, as to chosen spouses of the heavenly bridegroom; prepared for them a sumptuous supper, served and waited on them herself at table, gave them wholesome exhortations, and read the holy scriptures to them. They were surprised at her behavior, but could not prevail on her to tell them the reason. The next morning she returned to the prison, and told them she had been informed that that was the happy morning in which they were to receive their crown, and be joined to the blessed spirits. She earnestly recommended herself to their prayers for the pardon of her sins, and that she might meet them at the last day, and live eternally with them. Soon after, the king's order for their immediate execution was brought to the prison. As they went out of it Jazdundocta met them at the door, fell at their feet, took hold of their hands, and kissed them. The guards hastened them on, with great precipitation, to the place of execution; where the judge who presided at their tortures asked them again if any of them would adore the sun, and receive a pardon. They answered that their countenance must show him they met death with joy, and contemned this world and its light, being perfectly assured of receiving an immortal crown in the kingdom of heaven. He then dictated the sentence of death, whereupon their heads were struck off. Jazdundocta, in the dusk of the evening, brought out of the city two undertakers, or embalmers for each body, caused them to wrap the bodies in fine linen, and carry them in coffins, for fear of the Magians, to a place at a considerable distance from the town where she buried them in deep graves, with monuments, five and five in a grave. They were of the province called Hadiabena, which contained the greatest part of the ancient Assyria, and was in a manner peopled by Christians Helena, queen of the Hadiabenians, seems to have embraced Christianity in the second century. Her son Izates, and his successors, much promoted the faith; so that Sozomen says the country was almost entirely Christian. These one hundred and twenty martyrs suffered at Seleucia, in the year of Christ 345, of king Sapor the thirty-sixth, and the sixth of his great persecution, on the 6th day of the moon of April, which was the 21st of that month. They are mentioned in the Roman Martyrology on the 6th. and nine other saintly children. The son of Alexander, a general in the imperial Byzantine army of Belisarius. 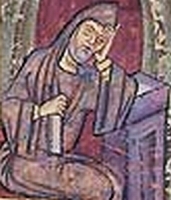 Monk at Amasea in Pontus (in modern Turkey) at age 30. Archimandrite of a monastery in Constantinople (modern Istanbul, Turkey). Patriarch of Constantinople from 552, nominated by Justinian the Great and confirmed by Pope Vigilius. 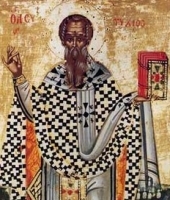 With Apollinarius of Alexandria and Domnus III of Antioch, he called and led a council from 5 May to 2 June 553 to deal with the Three-Chapter Controversy, and Eutychius composed the decree against the Chapters. He consecrated the re-building of the Hagia Sophia church in 562. Beginning in 564, Eutychius came into theological conflict with emperor Justinian who began to believe the Aphthartodocetae who taught that Jesus’s body was incorrupt, not subject to pain, and thus that he was not fully human as well as fully God. Bishop Eutychius began to speak and write against this heresy, which led to his arrest, while celebrating Mass, on 22 January 565. Justinian tried to have a show trial, but Eutychius refused to cooperate, which led to him being exiled for over 12 years. In October 577, with the support of emperor Justin II, Eutychius was recalled and resumed his seat as patriarch of Constantinople. He was welcomed back to the city by Christians who were so happy to see him that there was a festival and banquets; the Communion line at his first Mass lasted six hours. Toward the end of his life, Eutychius got it into his head that the return of Christ would be spiritual, with no physical return, which is heretical, but he later returned to orthodox thinking on the matter. A surviving biography of his life was written by his chaplain, Eustathius of Constantinople. Born to the Gallic upper class. Educated at the cathedral school of Saint Germain. Priest. Canon at the church of Saint Genevieve in Paris, France until c.1170. Widespread reputation for holiness and austerity; his life was so austere that his brother priests harassed him into leaving the city. When Pope Eugene III implemented stricter discipline in 1148, William returned and became sub-prior. When there was a need for some one to help reform the discipline and liturgical devotion of the Danish monasteries, the bishop sent William. While working at Eskilsoe, he became its abbot, and stayed for 30 years. Faced opposition from lax brothers and local nobles, but never flinched. Founded the abbey of Saint Thomas in Aebelholt, Zeeland. His extensive correspondence has survived, and is a valued source for Danish history of the period. Oldest son of Antonio Agostini, a physician, and Agela Frattini; his father died when Zefirino was very young. Ordained on 11 March 1837. Curate, youth minister and catechist at Saint Nazarius church for 8 years. Assigned as priest to a very poor parish in 1845. Established after-school programs for girls, religious instruction for mothers, and education for women. Initiated excited devotion to Saint Angela Merici among his female parishioners, and founded the Pious Union of Sisters Devoted to Saint Angela Merici whose rule was approved by Bishop Ricabona in 1856. On 2 November 1856, he opened his first charitable school for poor girls. After 1860 some of the local women who worked at the school chose community life; Father Agostini prepared the first rule for the community, and on 24 September 1869 the first twelve Ursulines made their profession. On 18 November 1869, they founded the Congregation of Ursulines, Daughters of Mary Immaculate. Catherine's entire family died of plague when the girl was very young, and she was adopted by a woman in Milan, Italy. At age 14 she felt a call to devote herself to the service of God, and lived 15 years with a group of women hermits in the mountains near Varese, Italy. Noted for her austere lifestyle and personal piety, surviving wholly on irregular gifts of food from spiritual students. She attracted so many would-be students that she agreed to lead a group of five, including Blessed Juliana Puricelli, living under the Augustinian Rule; Pope Sixtus IV approved the community. Known to have the gift of prophecy. Born to the Roman nobility, the daughter Symmachus the Younger who served as consul in 485; sister-in-law of Boethius. Lay woman, marrying soon after her father's murder, but widowed after a year of marriage; legend says she grew a beard to avoid further offers of marriage. She became a wealthy and pious recluse on Vatican Hill, joining with a community of women near Saint Peter's Basilica, caring for the poor and sick, she founded a convent and hospital. Reputed to have once healed a young deaf and mute girl by blessing some water, and having the girl drink from it. A brief biography of her was written by Saint Gregory the Great in his Dialogues. Believed to have been the inspiration for Concerning the State of Widowhood written by Saint Fulgentius of Ruspe. An image now above the altar of Santa Maria in Campitelli, Italy and formally housed in a church dedicated to Galla, is thought to have been based on a vision Galla received of Our Lady. Born a Calabrian family who had been forced to emigrate due to Saracen invasion. He returned to Calabria, Italy in 1040, he first lived in Reggio Calabria, then became a monk at the monastery of Saint Elias of Aurlia. He worked as a shepherd, using the solitude for contemplation, and a gardener, giving his produce to the poor and brother monks. The monastery of Saint Elias was later renamed Elias and Filaret in 1133 in his honour. Benedictine monk. Priest. Poet. Musician. Teacher. Writer. Historian. Hagiographer; wrote a martyrology, a collection of legends, and a metrical biography of Saint Gall. Friend of Saint Tutilo. Son of a weapons manufacturer. Attended a Don Bosco Oratory as a boy, and met Saint John. 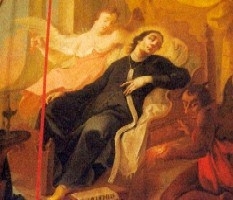 He impressed Don Bosco so much that the future saint sent Michele to college, and made him his assistant in youth work. Priest. Member of the Salesians of Don Bosco. First successor to Saint John Bosco as Superior General of the Salesians; under his leadership the community grew from 700 to 4000 members, from 64 to 341 houses. People who knew him said that he had the gifts of reading hearts, healing and prophecy. Civil engineer. Dominican, taking the name Michal. Priest. Executed in the Nazi persecution for ministering to wounded resistance fighters in World War II. Martyr. As a young man, Galindo fled from Spain to France ahead of the Saracen invaders, and there changed his name to Prudentius. Priest. Bishop of Troyes, Nuestra (in modern France). Worked for monastic reform and a return of monastic discipline. Created a combination catechism and breviary based on the Psalms to teach some basics to candidates to the priesthood. Convert. Priest in the apostolic vicariate of West Tonkin (in modern Vietnam). Spent a long period in prison for his faith while still a seminarian. Seminary administrator. Wrote a book that compiled a catechism with a collection of homilies. Martyr. Bishop of Sirmium, Pannonia (modern Sremska Mitrovica, Serbia). Arrested and tortured in the persecutions of Diocletian, he refused to sacrifice to pagan gods. Ordered drowned for his faith, he objected that as a Christian he should be allowed to bravely face his tormentors and executioners; with God on his side he should be treated as courageous and honourable. Martyred. His Acta has survived to today. Mercedarian friar. 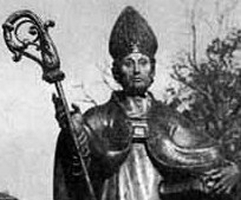 In 1225, he accompanied Saint Peter Nolasco to Algiers where they freed 219 Christians who had been enslaved by Muslims. As part of that mission, Guglielmo stayed as a hostage to guarantee the payment of the remainder of the ransom for those slaves; he lived there the rest of his life, preaching Christianity to whomever would listen. Monk at Iona Abbey in Scotland. Bishop of Kirkwall in the Orkney Islands of Scotland. Brother of Saint Agrarius the Martyr. Imperial Roman representative in North Africa. When he opposed the Donatism heresy, he was murdered by Donatists. Martyr. Monk at Abingdon Abbey. Friend and spiritual student of Saint Ethelwold. Known for his humility and his obedience to duty. Bishop of Ramsbury, England. 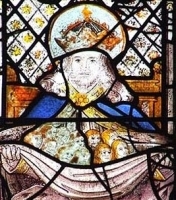 Abbot of Abingdon. Brother of Saint Marcellinus the Martyr. Imperial Roman judge in North Africa. When he opposed the Donatism heresy, he was murdered by Donatists. Martyr. Educated at the court of Clotaire III. Benedictine monk at Fontenelle Abbey under Saint Wandrille. Abbot of Flay, diocese of Beauvais, France. Spent his last years as a monk and hermit at Fontenelle. Deaconess. Founded a convent at Nisibis, Mesopotamia. Martyred with two others about whom we know nothing. Count of Grisalba, Bergamo, Italy. Holy man for whom Llechulched, Anglesey, Wales was named. I have no further information. Monk and then abbot at Saint-Loup-de-Troyes, France. Abbot of Peñalba Abbey near Astorga, Spain. A group of fourth century martyrs at Sirmium, Pannonia (modern Sremska Mitrovica, Serbia). We know little more than seven of their names - Florentius, Geminianus, Moderata, Romana, Rufina, Saturus and Secundus.